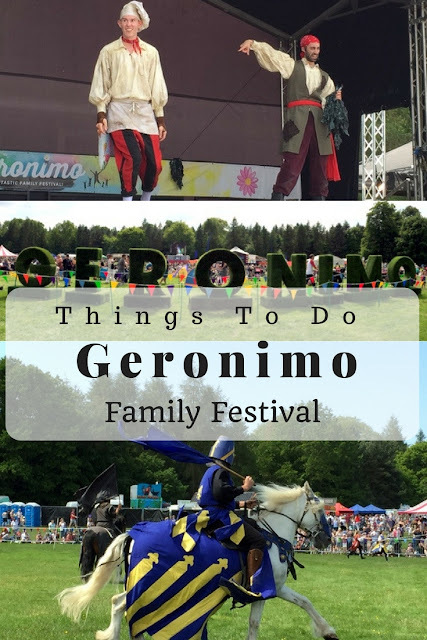 After a successful debut last year, Geronimo, the fabulous family festival was back at Tatton Park this May bank holiday weekend. As festival ambassadors, we were looking forward to this for a while now, and were lucky to have glorious sunshine right through the day. So it was more a case of topping up on sunscreen and fluids rather than scrambling for welly boots and a brolly. Here are the highlights of our day - my 7 must-do things at Geronimo 2016. My son is a huge fan of CBeebies. So it was no surprise that we hung around the Gernostage to catch some of the stars in action. Cook and Line from the Swashbucklers were in top form, performing the title track from the hit show. They had the audience in splits with their rip-roaring antics. Andy Day performed a fun and informative dino-rap. Justin Fletcher (aka Mr Tumble) rounded off the day with songs that had the crowds dancing and clapping along. J is now riding his bicycle very confidently and was very keen to watch the Extreme Mountain Bike Show. It was astounding to watch bicycles being handled with such precision and skill. You can have a go on the zip wire if you are feeling adventurous, or just a round on the big bouncy castle and slide if slightly less so. We had a go at den-building and then went on a bear hunt. This was where J got to use a pair of binoculars to spot clues dotted around the woods. There was no bear to be found, but a lot of tepees and gnomes. This was by far our favourite Geronimo zone. J and M had a go on the helter-skelter, the swing boats and swinging chairs. The ear-to-ear grins on their faces as the stepped off each ride said it all! Although there were queues to get on most rides, the children didn't seem to mind. There is so much to see and do at Geronimo even when you are queuing, from funky bands to giant puppets, nobody is likely to get bored. I enjoyed the concept of this zone, an open-air performing space where you can sit and eat your picnic while enjoying some truly incredible talent. There were dog displays with sheep dogs herding geese and others walking through rings of fire. There were medieval knights jousting on fine horses. And there were young bike riders performing dare-devil stunts. After all the adrenaline-fuelled excitement of the Arena and Adrenaline zone, this is rather sedate. But no less fun by any means. J had a go riding a cute little Shetland pony and a donkey. I was brave enough to hold a stick insect on my hand. M was too enthralled watching it climb up my hand and forgot to click a photo. Carry a picnic. Although there are enough food stalls on site, it does save you time and money. You can always top up on slush, ice-cream, donuts, chips and drinks, like we did. Now here are 7 more things that you could do at Geronimo, especially if the weather wasn't as nice as it has been. Watch a mini theatre production. Take part in a Frozen singalong. Decorate a duck, make a hat or a flower garland. Shake a leg and learn some dance moves. Try your hand at playing a harp and other musical instruments. Prepare for queuing cars. Although we set of early with the intention of arriving at Tatton Park for about 10 am, most people had a similar idea. The queues backed onto the main road and further up to the A-road. That said, the staff at Tatton Park were extremely efficient and we were parked up and on our way to Geronimo fun before too long. What would you do at Geronimo? we also went yesterday, it was fab for my boys! the loved the assult course with the headbands they got too and the bear hunt. we needed another day to do everything but did well to avoid the big queues in places, we took a big picnic, sun tent for baby and completely by accident found a different enterance with no queue getting in yay! Great tips looks such fun. I've never been to the Geronimo festival although it does sound like great fun. I have never been to Geronimo festival but it looks like a lot of fun for both children and parents. I would love to ride a pony (even if I would probably not be allowed because I'm not a child) and also I think the mountain bike show is something worth watching. Must be difficult to keep your equilibrium on such a narrow string. Wasn't aware of this festival. All looks perfect as a family weekend especially if the sun shines. I think my favourites would be the andrenaline and the fairground zone; I am a thrill seeker but a sucker for rides too. Looks like a great day out - we were supposed to go but Hubby had to work and I didn't fancy driving 5 hours with 3 small children! I would definitely like to go the adrenaline zone but hey decorating a duck sounds interesting too. I'd never heard of this. It looks brilliant! Our girls would have loved it.